"6 Most Popularly Used Test Automation Frameworks"
Business Intelligence comprises the strategies and technologies for the data analysis of business information, to understand consumer trends and optimize your company’s business operations. Smart organizations are adopting business intelligence to get ahead by transforming data into actionable intelligence to take advantage of opportunities, predictive to challenges, better business decision making to overcome threats. With business intelligence, companies can analyze data which will benefit to transform performance, boost revenue, increase incomes and enhance customer satisfaction and retention. BI is one of the quickest and easiest methods to analyze business data leading to better decision-making and strategic business insights. On a daily basis, companies generate lots of data which includes information about sales, marketing, inventory, and finance. Business leaders often rely on experience and ‘gut-instinct’ to make organization’s strategic and tactical operational decisions. However, it’s important to know how to use analytical data to predictive as well as prescriptive analytics with reduced manual errors. With detailed intelligence about the state of the business enables companies to adjust the marketing pace in their industry. A good, fact-based decision making BI solution makes this easy and available to anyone, not just IT experts. 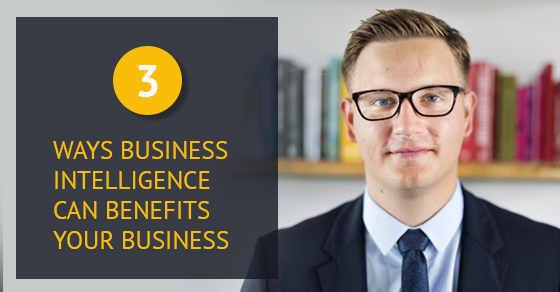 Here are the 3 ways to use BI to take benefit of your business. BI focuses on analyzing data, identifying trends and turning data into usable information to identify problems which highlights business improvement opportunities. It lets you identify where sales are most efficient (its strengths) and where it lacks improvement in order to boost your profit margins. Tracking sales data at an individual customer level can reveal your top customers, trends, products, and promotions to find new growth opportunities to the better position of your company. By understanding what your customers are looking for, and what they are not, you will be able to spoon feed opportunities to your marketing team. This will help them to make faster, more informed business decisions and also to identify potential areas to increase revenue within an existing customer base. As all knows, the probability of selling to an existing customer is far easier than selling to a new customer. Here BI helps you to find out your potential customers as well as, various ways to engage and inspire existing customers. Effective inventory management translates to having, the right amount of the right stock at the right location rather than, carrying too much stock as it damages your bottom line. BI solution will leverages fact-based analytical model to analyze your supply chain and to ensure you have optimal inventory levels. BI will also helps you to carry detailed, in-depth analysis of past sales transactions, navigate seasonal changes, understand the factors that influence sales, better anticipate demands, and relate their stocking positions to both short and long-term trends. For business success, effective stock management is very crucial. The promise to deliver products just in time to satisfy customer needs at minimum cost plays a key role in securing sales otherwise, it lets your customers turn into your competitors. BI lets you quickly and easily find how much stock you have for each and every product you have. By analyzing your historical data, BI lets you identify you are on overstock or running at the risk of understock. It helps you quickly make a data-driven decisions about minimizing inventory bloat. Simplify analysis and get a clear picture of your financial status with BI, not just survive but thrive. The right BI solution can blend financial statements with real-time data analytics from all lines of the business to boost revenue and manage expenditures. Profit and loss (P&L), balance sheets, internal and external accounting, cash flow, group and department accounting can be analyzed using graphs, charts, and dashboards to make the right decisions to drive your business forward. Employing BI correlates financial outcomes with business activities and leads the organization towards your strategic objectives. With BI, you can better manage your company’s financial health with a total overview to your financial status on specific entries, and have a closer look at transaction levels and allows you to compare across time periods too.